Suga does Lunch Gypsy style at Gypsy House Tapas! Quiet restaurant tucked away on the side of Chelsea Avenue that is appropriate for a lunch or dinner date. The location smears aesthetics, but inside is a whole different world, a gypsy world. The menu has a variety of items falling under the category of international cuisine, but highlights Spanish and Jamaican dishes. The staff, including Head Chef, Shane Stamp were polite and welcoming. I believe that for such a unique menu, my server, Kereen should have given me a brief introduction to the dishes of various cuisines being offered. The menu takes you from Jamaica to Mexico, over the wall to the USA, deports you back to Puerto Rico, then takes you on a tour as far as Spain and more. Kereen could have been a bit more attentive too, to check how my lunch was going. Afterall, I was by my lonesome. I am not sure why, but my appetizer and main were served at the same time. I ordered Gypsy House favourites. Servings were large for a reasonable price. The Saltfish Ceviche was tasty indeed. Their Seafood Paella was nose-running spicy and full of flavour. I enjoyed it. Kereen informed me that Mama Gypsy Jerk Chicken and Island Pancakes, as well as the Char Sui Pork Belly appetizer are favourites too. So I will probably give those a try next time. Gypsy House was definitely value for money. I have had food from Gypsy House Tapas at various local events, but I prefer dining there. Check out Gypsy House Tapas Restaurant for Lunch or Dinner this week! Jabba’s Smoked Grill and Peppa Swims! Have you heard about Jabba’s Smoked Grill and Jabba’s Peppa Swims?! Gear up for next year, because if you are in the corporate area, especially New Kingston, some delicious, affordable food can be delivered to you at work or home, free of cost. Pick up options are also available. Sounds great right? Another option to add to our very limited lunch selection. Lunch from Jabba’s Smoked Grill is available on Saturdays. Lunch costs $600JMD inclusive of delivery in the corporate area. You have a choice of either Jerked or Barbecue chicken along with sides of sweet potato, rice and peas and/or roast breadfruit. Jabba’s Peppa Swims are mild or spicy packages of shrimps available on Tuesdays and Fridays at a cost of $280JMD each. But don’t worry, the spicy one will not leave you choking. It is tastefully done with the right level of spice so you enjoy it but you are comfortable at the same time. As deliveries are done mainly in New Kingston, they are currently a big hit with corporate offices such as JMMB, Sagicor, Barita and more. So you don’t need to travel to St. Elizabeth for ‘swims’, you can get them delivered to you or pick up at 31-33 Trafalgar Road (BNS with no sign), opposite the NCB atrium, anytime between 8am and 5pm. For both Jabba’s Smoked Grill and Jabba’s Peppa Swims, it is best to order the night before or on the day before 12 noon, by calling 876-296-7304. Ok so now you know what is offered and the cost, but who does the cooking? Jabba! Who or what is Jabba? Jabba is young, Jonathan Simpson, who just has a love for cooking and was thus inspired to start this endeavour. I have actually tasted Jabba’s chicken from as far back as 2008 at a friend’s baby shower. Yes! Jabba does catering too and used to even have a small restaurant back in the day that offered Jamaican lunches such as Curried Goat, Oxtail, Cow foot, Jerked Chicken and more. Where has Jabba been all these years? A few years ago, the restaurant business alone was not enough for Jabba and he felt that a ‘9-5’ would be better for the finances so started working with Scotiabank. But when something is just a part of you, it always finds its way back. So recently, he found a way to still work with the bank but to branch out into what he loves to do even more as well, cook. Who taught him how to cook? Well the Chicken and other things came naturally to him for the most part but a young lady who he used to buy shrimp from taught him how to prepare the shrimps aka ‘swims’ when he developed an interest to do it himself. How did the rave about Jabba’s Swims begin? About 4 or 5 years ago, Jabba prepared his shrimps for a fundraiser at the office and the people wanted more. The interest and liking for it spread by word of mouth to different offices within the area. What makes Jabba’s Chicken and Shrimps different? It’s all about the freshness, the sauce and the general taste of the food. Freshness is important folks, so it is unlikely that the Peppa Swims ‘goi run u belly!’. Pepper shrimps are a local favourite but a lot of the shrimps sold on the street side are not fresh. Jabba’s shrimps are usually prepared on the morning of or the night before they are sold. They are a hot commodity so they sell off in one day. If you are brave, I have been told that you can refrigerate and have the shrimp up to 5 days after purchase or a day after if you do not refrigerate. With regards to the sauce, I remember licking the sauce off my fingers from that Chicken from 2008! Yes, literally ‘finger-lickin’ good’. Then of course, the taste is unique as a result of the preparation with freshness, seasoning and the added sauce or peppers. Where is the Chicken and Shrimp sourced from? Chicken is sourced from Best Dressed Chicken and the Shrimps from Rainforest Seafoods. What has Jabba done catering for before? His ‘Eat All You Want Buffet Seafood’ years ago and most recently, Weddings and parties such as Haunted and Afloat Soca Cruse. BBQ Pigstail, BBQ Chicken, Pasta and Garlic bread were a hit at Haunted! Can you order this week? Sorry Suga bears, Jabba’s Smoked Grill and Peppa Swims is currently closed for the holidays and will reopen for business by Saturday, January 9, 2016. The near future of Jabba’s Peppa Swims? By the 2nd week in January, Jabba’s popular Peppa Swims will be at Bickles in Sovereign Centre Food Court on Wednesdays and Saturdays for $300JMD per bag. So as we think about food of all kinds for the festive season and wonder how we will afford lunch in January, look out for Jabba’s Smoked Grill and Peppa Swims next year! Not many persons may know about this tiny restaurant hidden behind the gas station at Mary Brown’s corner on Constant Spring Road, but they certainly have an active Instagram page that I have been following for a little while. I finally got to check it out on my day off last Friday to see how they handled their usual work day flow. I reached a little bit later than I wished, about 2:15pm. It was easy to find because everyone knows that gas station and you cannot miss the sign. Parking is limited but if there is difficulty with access, there is more than enough space to park by the gas station and walk around. I didn’t need to do that though because a spot was available, much to the unnecessary annoyance of a ‘parking assistant’ that was either confused about his nationality or deported from the UK. Why can’t Jamaicans just go to and fro in peace? Anyhow, I was impressed to walk in and see a fairly full restaurant with adequate, comfortable seating. The logistics for such a small area were on point. A plasma television and music were there for entertainment. There was nobody present to take an order, but a patron quickly pointed out that I should ring the bell and out came someone immediately. Prices were not cheap, but they were not expensive either. I ordered the $580JMD (two piece) Jerked chicken that came with rice and peas and vegetables. There was a $700JMD and odd option too. I also added their fried dumpling that was advertised as one of the best Johnny cakes in town. I took a seat by the cafe area and my food was out in two minutes. The verdict? Quality rice and peas. No ‘clumpy clumpy’ or uncooked grains like other lunch establishments. A good fried dumpling, not the best. I am still waiting on a Johnny Cake experience like back in the day from a fish shop in Manor Park. A big fat juicy one bigger than a tennis ball in a brown paper bag. Perhaps J & R Grocery & Snacks ‘aka’ ‘The Dumpling Shop’ on 44E Waltham Park Road, nominated and featured at last year’s Table Talk Jamaica Observer Food Awards has come the closest. Why do they call it a Johnny cake anyway? Of course with Jamaicans the name has probably been altered over the years by Chinese telephone. They were actually called Journey cakes because slaves used to carry them on long trips in saddle bags and baked them along the way. Back to the meal. The Jerked chicken and sauce were tasty and a bit spicy but not too spicy. Very filling serving as well. When I almost finished, I spotted a server slicing what looked like bread pudding from a far, my weakness. I asked her if that was what it was, she confirmed and I instantly had a slice of yummy bread pudding that they bake fresh. Although other items in their cafe such as the cookies and cakes are brought in, they sometimes do their own banana pudding and chocolate cake, along with the bread pudding. The server asked if it was my first time visiting and asked me my name. Surely a homey, feeling. They serve Continental breakfast and other items on their menu include BBQ chicken, Oxtail, Fried Chicken, Cow foot, Stew peas and more. Suga Lifestyle definitely endorses Michael’s Restaurant and Coffee Shop as a decent spot to enjoy some good Jamaican food. 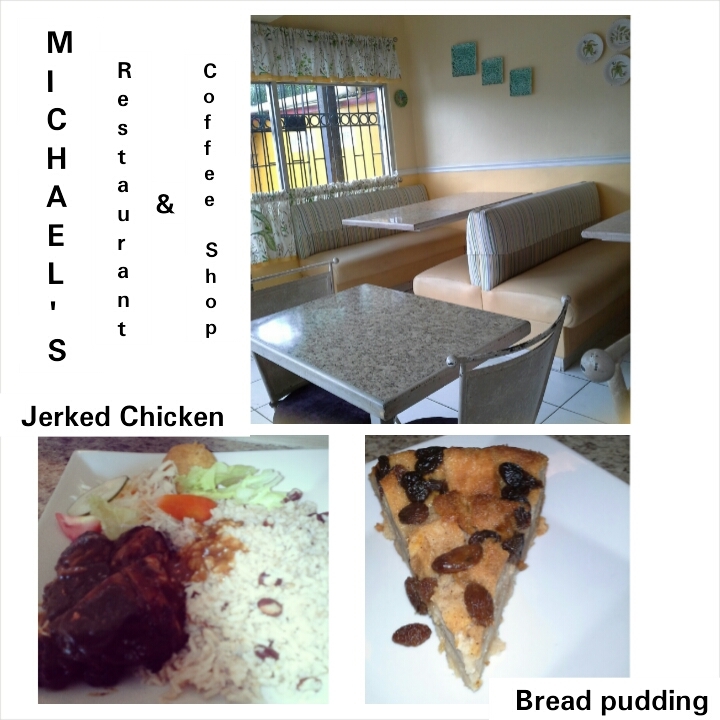 Follow their Instagram page, michaelsrestaurantja for specials and daily menus as well as their Facebook page, Michael’s Restaurant and Coffee Shop. Michael’s does catering and delivering as well. Their delivery charge is $300JMD as long as you are not too far, for instance, Spanish Town. Opening hours: Monday – Friday, 7am-7pm, Saturday, 9am-7pm and Sunday, 9am-4pm.